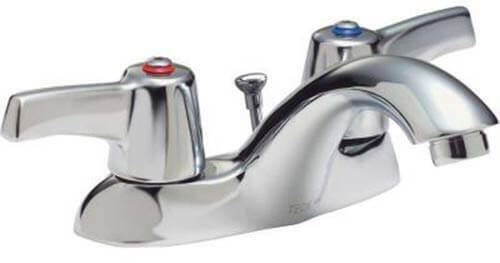 Since Pam’s favorite 4″-centerset bathroom sink faucet (from Strom Plumbing ) appears to be no longer available, Pam assigned me to search the sea of other styles available today to identify other options. I found 14 retro bathroom faucets — all sitting on on four-inch centers — from nine companies that we think would be a good aesthetic fit for a mid-century bathroom sink. Search tip: Several of these faucets are labeled for commercial use — so a reminder, as we’ve discovered before: checking a company’s commercial offerings can be a gold mine for retro home products such as faucets, flooring and lighting. AND: As time goes by, be sure to check the comments on this story, too, as readers often find additional options and add them to our comment stream. We may not update this story for a long time — so read those comments, too. This list of 14 is roughly in order of our aesthetic preferences — our favorites at the top. However, we are not experts on quality, so that is something you will need to research. 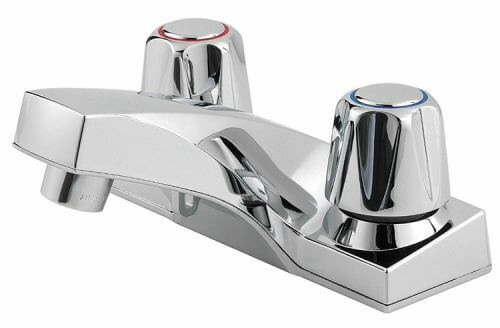 The Metropolitan style faucet from Elements of Design is a top pick for looks (love those hexy edges). It looks very similar to one of Pam’s all-time favorite styles from Strom Plumbing/Sign of the Crab — Mississippi faucet — which is no longer available as a 4″ centerset design. 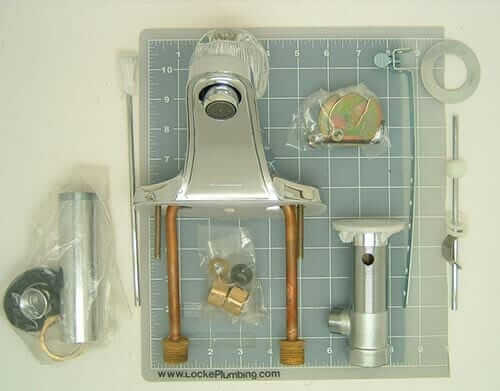 Above: Top of our “we like the looks list: We like the angular styling of this Union brass 70A 4″-center chrome lavatory faucet from Locke Plumbing. It’s Pam’s sense that faucets in the 1940s and 1950s had angular design touches like this; not 90-degree angles — but angles like you’d see on a hex nut. 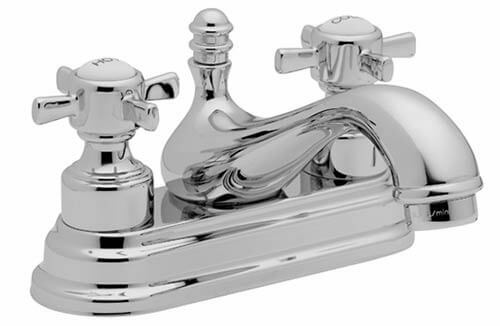 This affordable Kingston Brass 4″ centerset faucet — available through Amazon.com — has great “hex” details that make it a pick for a post-war bathroom faucet. 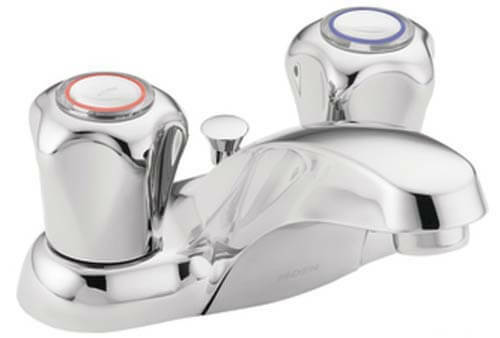 Above: The Kohler Triton 4″ centerset faucet would look great with a pastel hudee-rimmed sink in a mid-century bathroom. I’m considering this style to replace the high arc bathroom faucet in my hall bathroom. 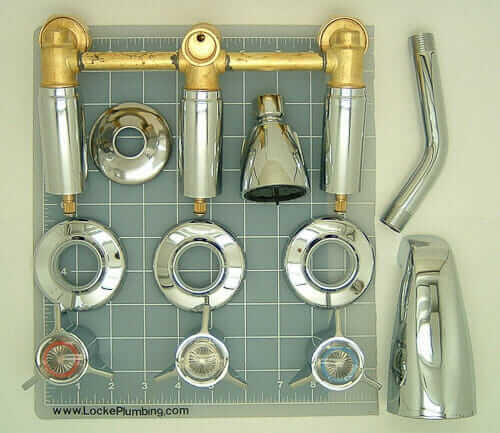 Above: We just recently learned of two retro-styled 4″ centerset faucets from the Pfister Pfirst line through a tip from reader Matthew, who used these affordable faucets in his mid-century bathrooms. Simple, good taste, and a classic design that has been around since the 50s. They’re very reasonably priced as well. Perfect to go on my vintage seafoam green sink. Above is another mid century styled faucet from Pfister’s Pfirst Series — an excellent choice for a retro bathroom refresh. Mega thanks for the tip, Matthew. 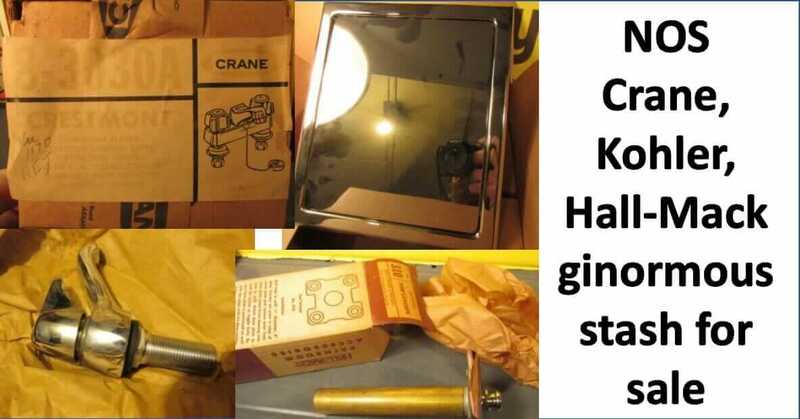 Pam previously identified this American Standard single handle 4″ spread Colony bathroom faucet as one that could be straight from the pages of a 1955 Homart bathroom catalog. 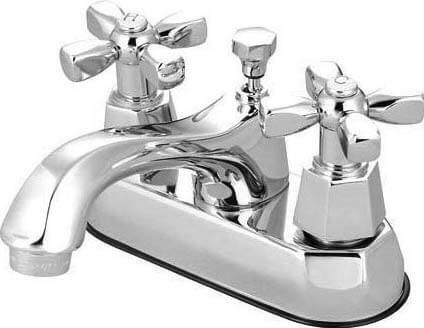 Note: Reader Jason just wrote us to say he purchase this faucet. He said that while he likes the looks in his bathroom, he was disappointed that the material used on the bottom throat of the faucet spout (the non-shiny piece/plate you see in the photo above sweeping from the inside base of the faucet up to the where the water comes out) is a chrome-covered plastic, rather than metal, Jason said. Looking at the Pfister photos, it seems like their design might use this sort of material in their design as well. We do not the trade offs. 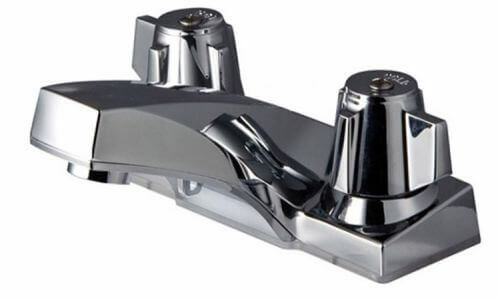 I found this Chateau Chrome two-handle low arc 4″ centerset bathroom faucet from Moen, which is similarly styled alternative to one of the Pfister faucets above. 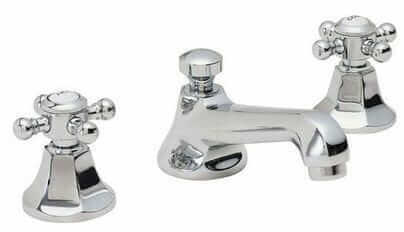 Delta had two options for 4″ centerset mid-century styled bathroom faucets. 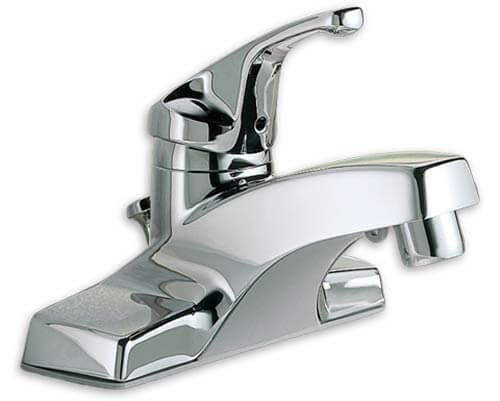 The first is the Classic chrome two handled lavatory faucet. Note, we are now at the point in our list where the faucet part is getting too tall and rounded and swoopy (rather than squat and angular) for our period tastes. But, there’s some appeal to these last few, so we’re including them. 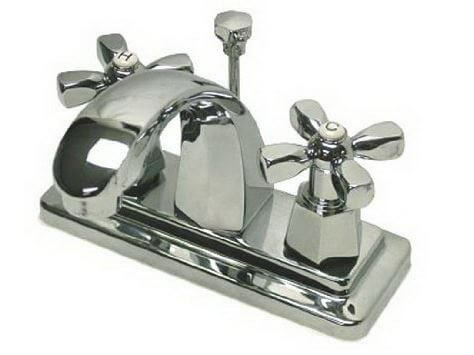 Above: and from Delta’s commercial offering, this 4″ centerset lavatory faucet. And heading into the postmodern era — If 1960s and 1970s crystal knobs are your thing, this Wolverine Brass Endurance Lavatory With Pop-Up Acrylic Handle from Locke Plumbing has a nice look. 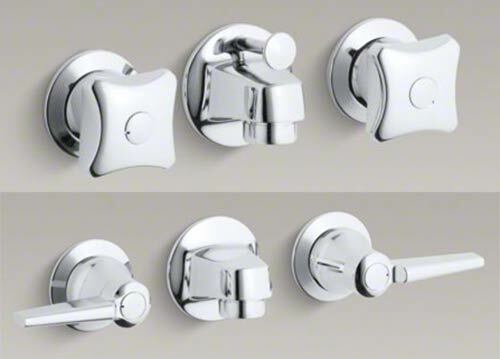 Since Pam constantly gets emails from readers who are looking for replacement slant-back or shelf-back bathroom faucets, we also wanted to repeat our known resources. 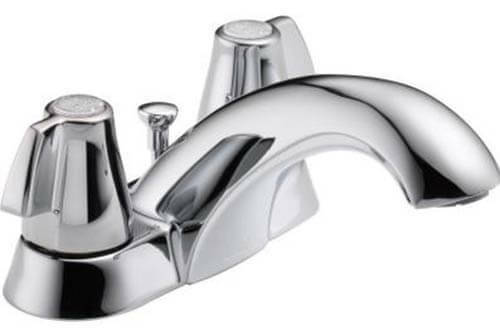 Our first go-to source woudl be DEAbath.com, which offers both slant-back and shelf-back faucets — above. And, above: The Kohler Triton line also includes a shelf back option, which is what Dave and Fran used in their 1930s bathroom remodel. Thanks, Dave, for this tip! Need sink parts? See all our sink stories here. 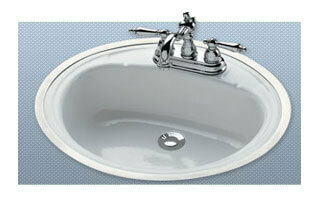 See all our bathroom sink and vanity stories here. For those of us who have ledge-back and slant-back sinks with 8″ centerspread faucets, Union Brass is the only manufacturer who has one listed for that application in their catalog. However, I received an email from Central Brass today with the part number for an 8″ conversion center tee for their 1177 (ledge-back) and 1178 (slant-back) faucets! CS-43009 is the part number, it’s not in the Union Brass catalog but it is available. 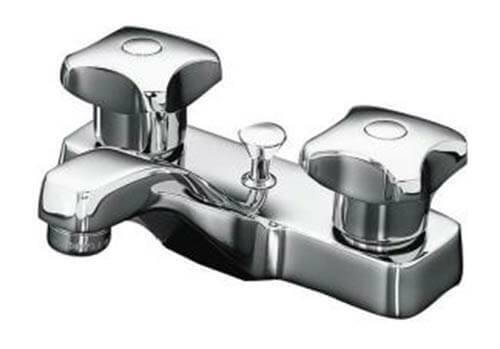 I think Chicago Faucet Shop lists it on their web catalog. I finally installed one of the Central Brass 45* slant-back faucets on my original pink 1954 Briggs sink this weekend. It looks and works great! The original faucet hadn’t been removed in 60 years and was leaking, though it’s overall in good mechanical condition. The drain assembly was so stuck in place that I had to use a Sawzall to remove it. The Chicago faucet on the right is basically identical to the originals in my parent’s 1959 house. I’m trying to identify a faucet I found that’s similar to the american standard one in the article. Any idea about how to track it down? See website for a link to a picture. I don’t know the answer to this one, Kent. 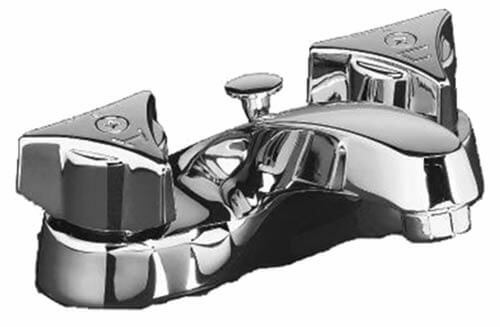 I know that this is an old article, but for those that may be interested, Peerless Faucet, Delta’s cheaper sister company, has older Delta Faucet designs that look more like the ones sold in the 1960’s and 1970’s, especially the single handle ones like P136LF-M that look like the ones first sold during the 1960’s (Delta did not sell two handle ones until 1970). The handle is a little rounder, but the base body looks about the same as the old ones.